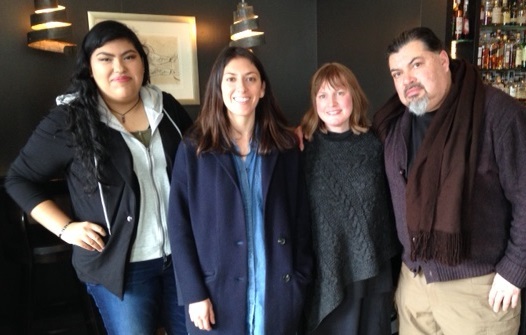 This past week, English Department faculty members Susanna Childress, Jesus Montaño, and I, along with student Sarah Herrera, met children’s book author and illustrator Angela Dominguez for lunch at a downtown Holland restaurant. Perhaps you know Angela from her bilingual Pura Belpré Honor Books María Had a Little Llama and Marta! Big & Small, or her fabulous middle-grade chapter book Stella Díaz Has Something to Say. We all were thrilled that Angela was willing to meet with us for a brief visit between her many readings at local schools and the Herrick District Library. During our lively conversation, the literature professor in me had to ask Angela about her intended audience: “Whom do you think about when you create your books?” Angela shared with us her desire to engage young Latinx kids who may not often find themselves mirrored in books typically housed in classrooms or libraries. Her words made me think of the power of diverse books for young Latinx readers. I have always been interested in how certain readers become experts (or “cultural insiders,” as some kid-lit scholars put it) when they read or listen to stories from their culture. In other words, they know more than the other kids during story time. Their cultural knowledge and language abilities (in this case, reading Spanish) give them the upper hand. In this way, diverse books that “translanguage”—scholar talk for using a mix of words in multiple languages—invert the common host/guest power dynamic, where (here in the United States) Spanish speakers are often the guest and English speakers are the host. Inverting this dynamic plays a significant role in affirming children’s identities, given the ways linguistic and cultural identities are interwoven. Along with thinking about Latinx readers, Angela shared that she also thinks about majority kids when she creates her books. She hopes that they will see kids in her stories who are different from them, with different skin tones and languages, not as other, but as potential friends. There are pleasures, as we know when we travel, in being the guest. If you are interested in diverse children’s and young adult literature (including Angela’s!) and live in the Holland area, check out Diversity Rocks the Book!, a city-wide program addressing the lack of access to diverse books this month. And if you are a Hope student, I invite you to continue this conversation in my fall 2019 course ENGL 375: Children’s and Young Adult Literature! I live Up North – would it be possible for you to e-mail me a list of the books in your Diversity Rocks the Books! program? I often use PBS credits to get books for my local charter school, and this list would be very helpful. Thank you. If you follow the link to the website, and click on the “Resources” tab, the booklists are there.